Over the past 20 years we have seen fads come and go, markets up and down, and new generations of homeowners with needs different from the last. One year all the rage will be about bamboo, the next laminate floor, and then the cork craze. Reclaimed wood is something that sounds like the right thing to do, but is it for you? We have sold FSC certified wood and reclaimed wood since the beginning of our business operations. We have also gotten our hands dirty in the hopes of unmasking the beauty of reclaimed floors we have procured and installed over the years. People are drawn to the story behind the wood and the whole act of unveiling the hidden beauty behind years of muck and grime. It is one thing to talk the talk of selling/promoting reclaimed and sustainable wood, but to actually walk the walk is a little less glamorous and profitable than it might seem. I remember the worst day in the history of our being in business. I was renting a space (without a dock) in a business incubator in downtown Madison. I was lured by the charms of an offer for a large load of reclaimed Maple taken from a publishing company of a famous label in Wisconsin. It was the hottest day of the year in 2002, and we were anxiously awaiting the arrival of our precious timber. The trucked backed up to our building, and with great anticipation, we opened those back doors. My Goodness! We were literally sold a pile of “garbage.” They say one person’s trash is another person’s treasure. Humm, I was pretty sure this was not the “treasure” I was promised. I wish I had photos to show off the horrific pile of wood, unbundled, not palletized, not cleaned Maple we received. Back then,cell phones did not take pictures. We had so make a chisel from cheap screwdrivers so we could scrape the tongues/grooves of each plank to remove the decades of muck that had adhered to it. Then we had to create bundles so we could sell this stuff properly. My poor college student intern and I unloaded all of the wood ourselves, which took hours. I will never forget the black stained and beaten hands we earned that day from our efforts in the hot, merciless Wisconsin sun. Reclaimed wood is not usually cheaper than regular wood. There is so much labor that goes into making it ready to be re-installed, that it erases any economies earned by culling old wood. Also, reclaimed wood may not be appropriate for many household applications. If the wood was used in a factory, it could ultimately gas out those chemicals into your home when the house gets really hot. No one wants their baby crawling around on a floor that gasses out vapors from its toxic past. Reclaimed wood available on Craig’s List or other local sources may have been installed in a home where their was pet urine. In fact, the main reason why people get rid of their floors is because their pets have destroyed it with their behavior–specifically urination. I walked into a Habitat Restore a couple of years back to look for something special. When I entered the back storage area of the place, I detected a very strong odor of pet urine. I promptly told the director that this floor is not salvageable. Even after the floor has been sanded and re-finished, the urine smell will return during periods of high heat or humidity. Most of the reclaimed we sell today is not sourced from factories or from household demo projects. Instead, we work with brokers who pull material from churches and schools. Another source is from smaller saw mills who re-mill support beams used in agricultural structures. 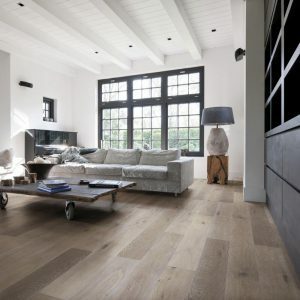 As an alternative to the reclaimed material, we offer FSC certified oiled White Oak Flooring. This offers folks the aesthetic of a rustic floor, but consistent quality standards with no outgassing and a floor that is ready to use upon installation. People can still purchase in an eco-minded way without the risk of exposure from potential vapors/smells of reclaimed wood. Please feel free to look at our full collection of FSC certified White Oak Flooring. Please let us know if you want/need to see installation photos or you need some samples and a quote.